About/History: "The idea of a foundation was born during some long conversations about the Polish industry, design and products. We realized, that even though many products are produced in Poland, very few of those products were invented and designed in our country. Poland is one of the largest manufacturers of cars in Europe – so what if all of those cars were designed abroad.They’re just made in Poland. The same goes for airplanes, fridges, TVs and many more items. Poland has one of the lowest factors of money spent on research and development in relation to a single citizen or the GDP. Our economy is not innovative – its just reproductive. What’s happening with young inventors and engineers? Supposedly, we are so creative. Where are those ideas? Is it easy to develop a new, innovative idea nowadays? How can we help the Polish engineers and designers get recognition for their work? And most importantly – the promotion of a country is most effective by associating products with the given country. The more innovative, advanced, good looking the product is, the stronger the association with the country it was made in. Ikea, Lego, Nokia, Mercedes-Benz, Sony – those keywords describe not only companies, but also the countries of their origin. This is how the idea of creating a foundation was born. An institution,which will help to promote the Polish technical innovation and help Polish designs come to life. We want to show that both in Poland and abroad, products with the proud „Made in Poland” are of the highest quality and we can be proud of them. We also want to support Polish engineers, technicians, specialists in design and ergonomy and help them put their ideas into production. We chose our patron to be a Polish industrialist, who has produced measuring equipment and manometers of highest quality in his factory. More information you can find on our website: www.gerlach.org.pl This is how G.Gerlach Fundacja Rozwoju Polskiej Myśli Technicznej i Mechaniki Precyzyjnej was created." In regards to the RWD-6: "RWD-6 was a Polish sports plane designed in 1930s. It was a winner of the “Challenge 1932” international tourist aircraft contest. To conmemorate this glorious event, here we present the first of the Polish Civil Aircraft series, RWD-6, with SubSecond and CentralSecond versions." Domed sapphire crystal with one side, internal anti-reflecting coating. Packaging and First Impressions: I was extremely impressed with the packaging and appearance of the watch overall at a $340 price point. 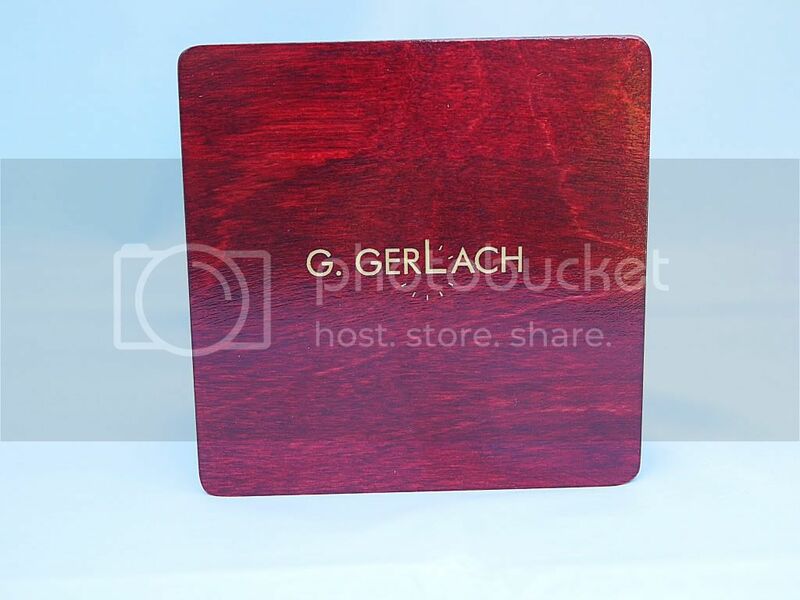 The watch arrived in a very nice wooden display box with the G Gerlach branding on the top. 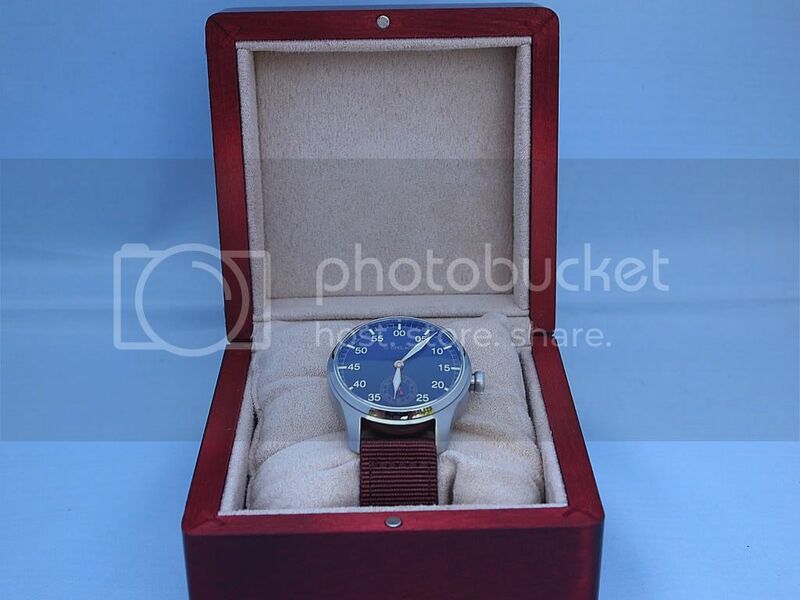 The interior of the wooden box was cushioned well to protect the watch during shipment. Very secure and elegant presentation overall. The hands and dial of the watch were the first aspects that caught my eye as well as the substantial nature of the case. Case: The RWD-6 case is composed of 316L stainless steel and measures slightly over 40mm. The case has a perfect combination of brushed and high polished surfaces for a classy appearance overall. The watch measures 14mm plus in overall thickness giving the watch a substantial appearance for a 40mm pilot watch. The lug to lug measurement of the case is approximately 46mm. With the measurements of 40x14x46 the watch case is appropriately sized for a wide range of wrists. The RWD-6 has a signed coin edged Pumpkin style Waterproof Screw Down Crown an absolutely fantastic feature as many pilot style watches come with push/pull crowns. The almost 7mm coin edge crown is easy to grasp. The crown engages smoothly and there is no play or wiggle in the crown when engaging the time changing function. Well done overall by G Gerlach providing a substantial case and screw down crown. Crystal and Dial: The crystal is a domed sapphire another great feature for a watch in this price range. The sapphire crystal opening measures 35mm providing for a much larger visual appearance giving the watch the illusion of greater size than the 40mm measurement. Beneath the sapphire crystal is a gorgeous sun-ray dial. 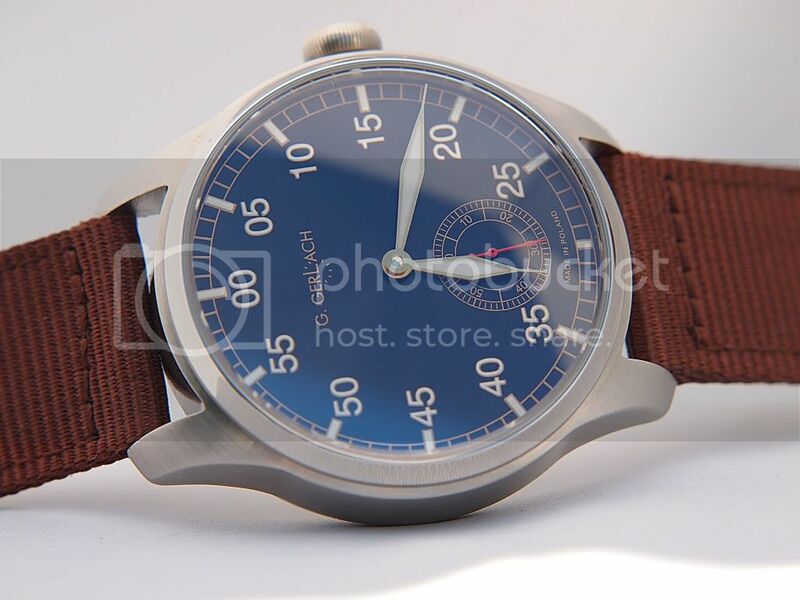 The dial is marked in minute format from 05-00 as seen with many pilot style watches which is a nice change of pace look for any watch collection. The markers are not applied but rather painted on the dial. Each numeral and marker at the primary minute/hour position is lumed and outlined in a gold paint. The non primary minute locations on the dial are also painted in gold surrounding the dial. 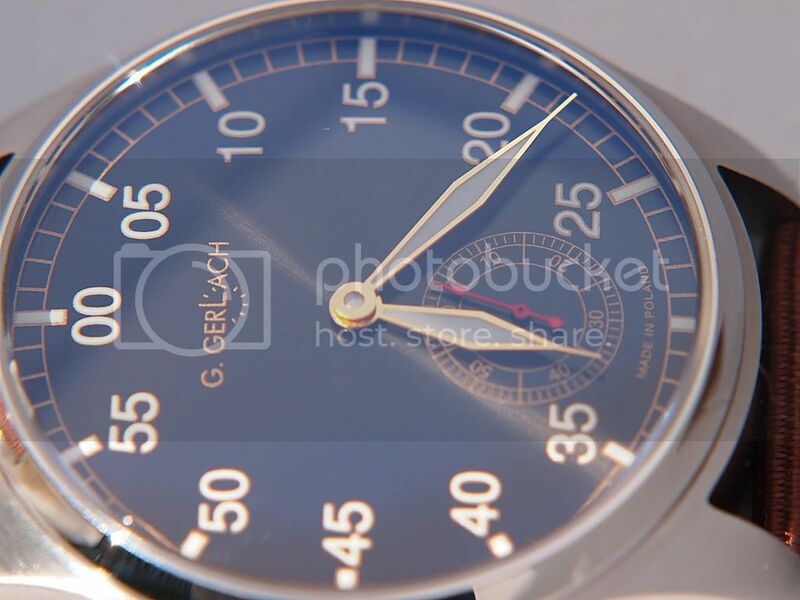 The G Gerlach branding is noted above center dial and the sub second dial is located below center dial. Made in Poland is notated on the dial at the 6 position. Very clean overall dial in appearance which is necessary for a small surface area to keep clutter to a minimum. The sub second dial at the 6 position is painted in gold to keep with the golden aspects of the dial. The sub second indicator is numbered at the 10, 20, 30, 40, 50 and 60 second marks. The sub second hand is red providing for a nice color contrast with the dial. The watch hands are roman sword type and are filled with lume. The hands are gold finished maintaining the elegant dial appearance. Overall the RWD-6 dial is striking with contrasting colors, numbers and markers. Case Back: The case back is perfect for the watch coordinating with the watch theme. The RWD-6 is etched in the central portion of the case back and various other specification information is layed out surrounding the case back such as branding, water resistance and serial number. 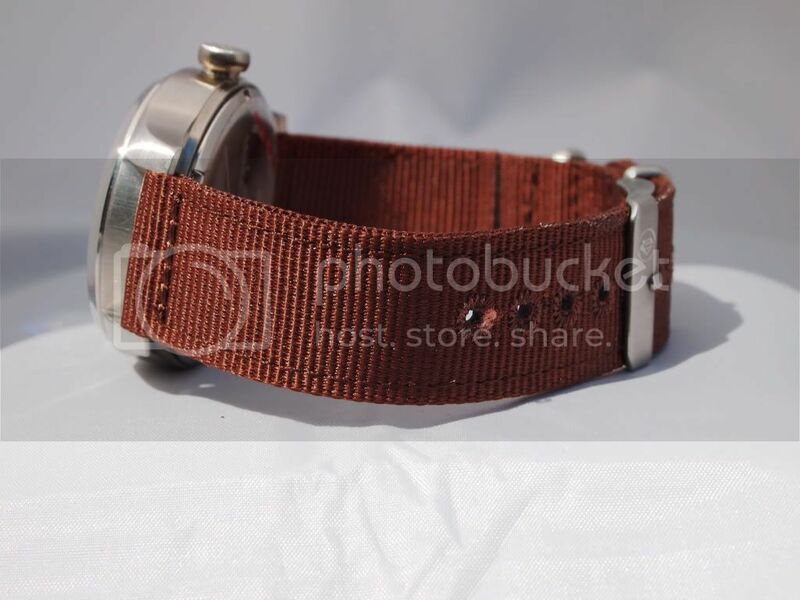 Strap: This variation of the RWD-6 came with a brown heavy duty nylon strap. The strap measures 2mm in overall thickness. 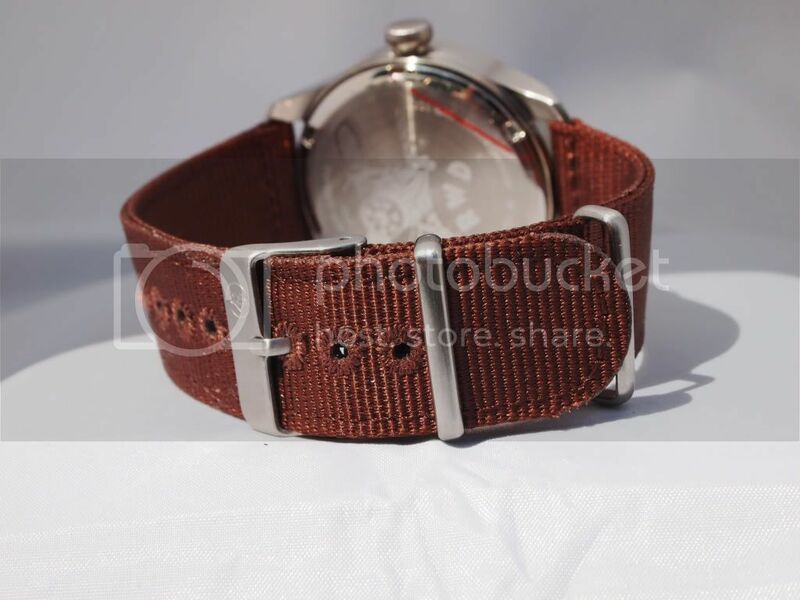 The strap contains a stainless steel buckle and 2 fixed metal keepers. 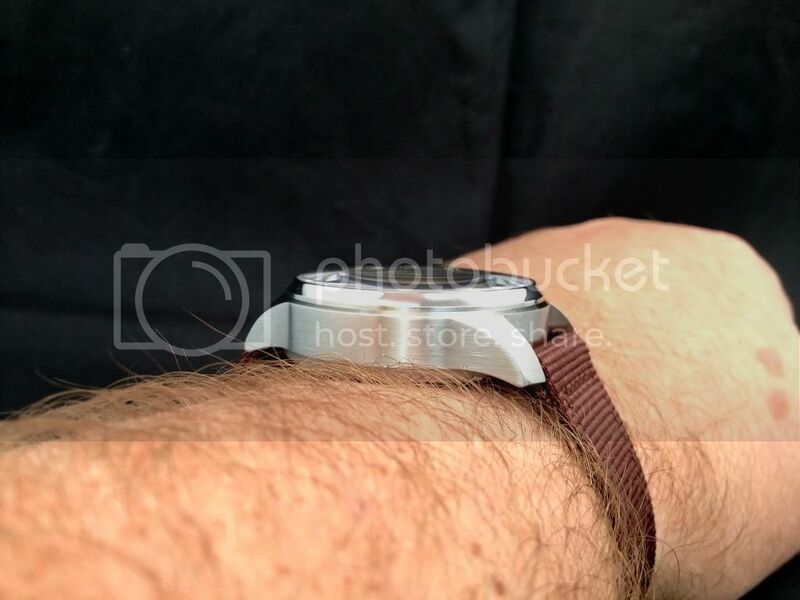 The strap may be the best nylon strap I have ever worked with on a watch. 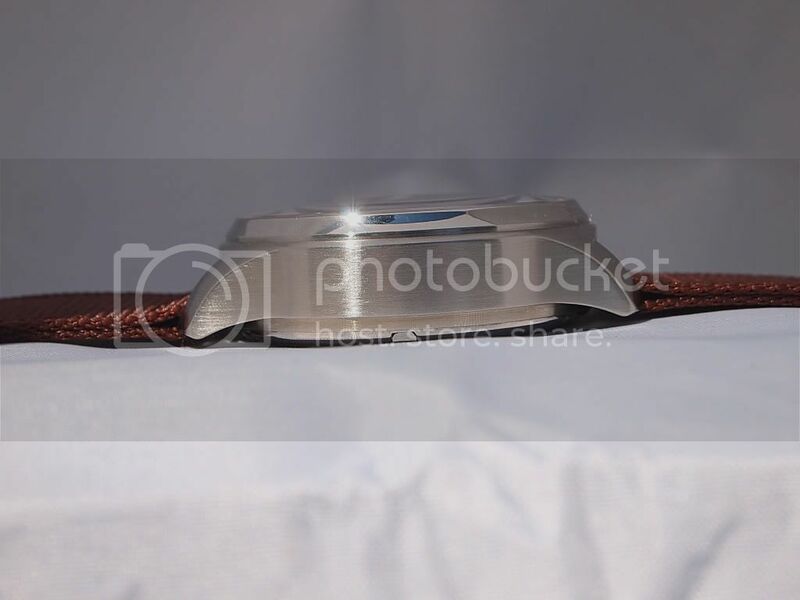 I believe that due to the appearance of the watch a nice pilot style or ammo pouch style strap would be perfect for the RWD-6. 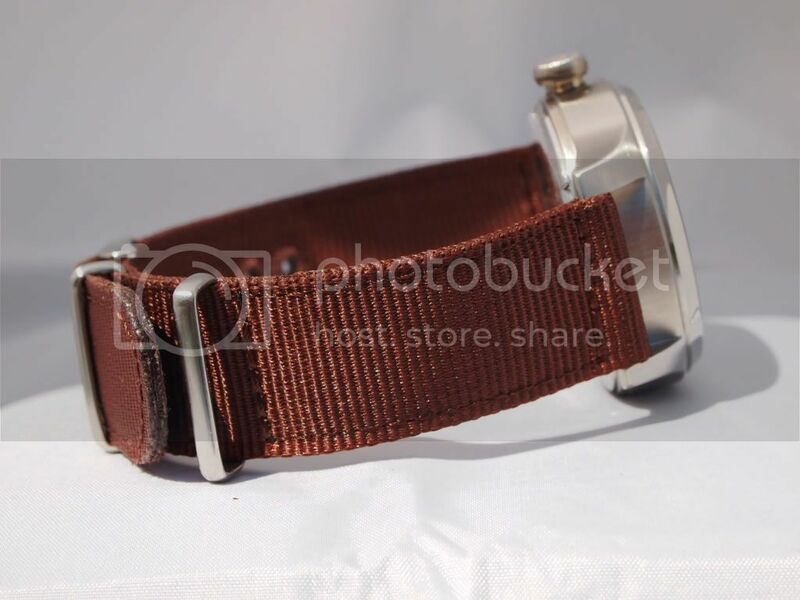 Of course supplying a higher quality strap would impact overall costs slightly but would be welcomed I believe by many. Wrist shot on my 7 1/2 - 7 3/4 inch wrist: As you can see the RWD-6 works well with medium to large wrist sizes. The watch sits well on the wrist with no overhang as well as being extremely comfortable on the wrist. The substantial case thickness for a 40mm watch enhances the comfort I believe. Movement: The movement is the SeaGull ST2526, Class AAA. I am not as familiar with SeaGull movements but outside of the movement beng a bit noisy it is a nice affordable choice. This version allows for hacking and hand winding. The small second sweep isn't quite as smooth as an ETA but is not overly choppy. In order to maintain affordability this SeaGull option was the perfect choice. Lume: The RWD-6 is utilizes C1 Superluminova with decent application. The white appearance of C1 lume aids with the overall aesthetic appeal of the dial. The lume charges well initially and the afterglow is present for several hours. 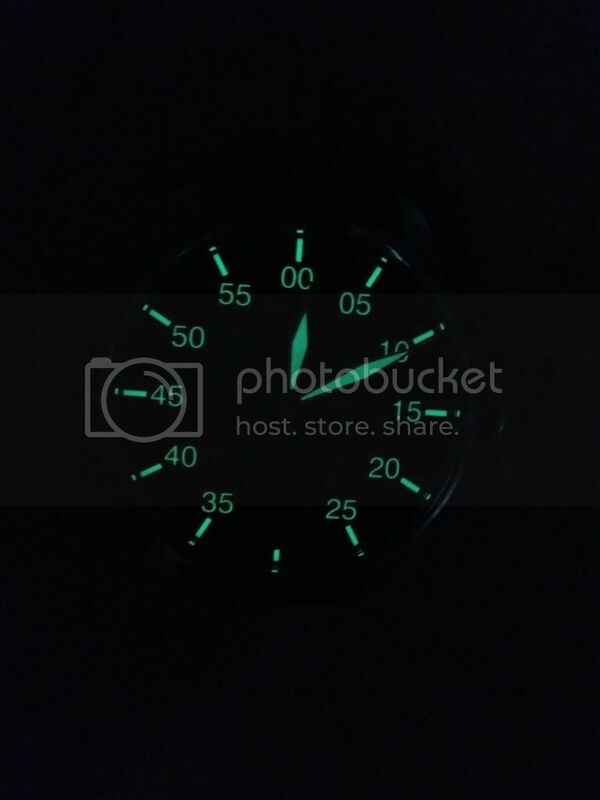 C1 was the perfect choice of lume for the watch in order to keep costs low while maintaining a great appearance. The alternative would be BGW9 maintaining the white coloring and enhancing the intensity of the lume. Of course a BGW9 upgrade would impact costs. Summary: The G Gerlach RWD-6 is a nice, affordably priced pilot style watch, with solid specifications. AR coated sapphire crystal, screw down crown, hacking/hand winding movement, substantial case all quality specifications for under $350 make the watch an excellent value and worth consideration. I really could not find any significant short comings with the watch but room for improvement or change to enhance the appearance and function of any watch is always possible. The only two specific areas that I could readily identify to enhance the RWD-6 are the strap and lume. As far as the lume is concerned I would just consider upgrading to BGW9. BGW9 would maintain the white appearance of the markers and hands but increase intensity and duration of the lume. The strap is the primary specification with lots of room for improvement. 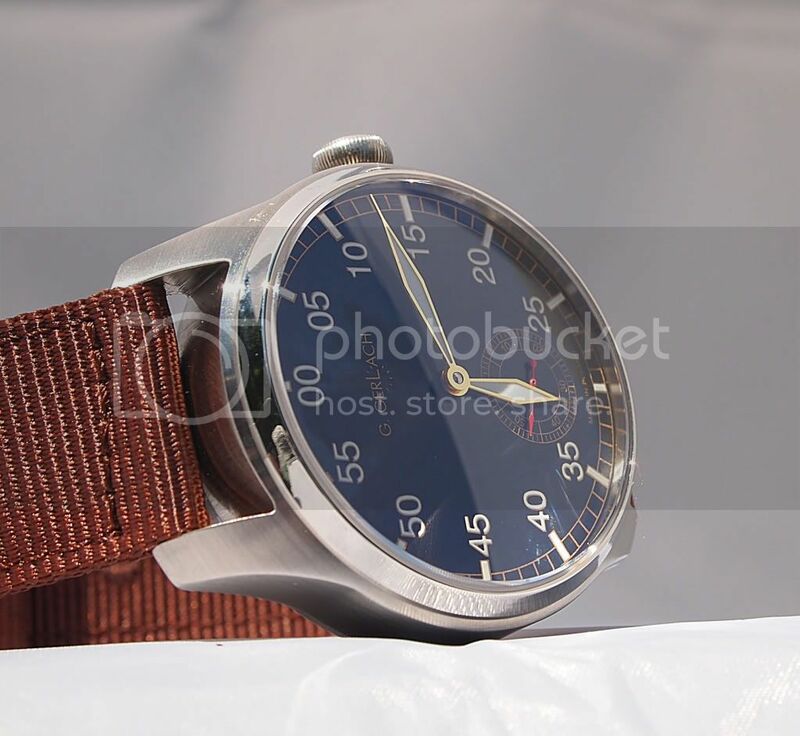 The RWD-6 is a pilot themed watch, therefore, should come standard with a higher grade strap such as a leather pilot watch strap. 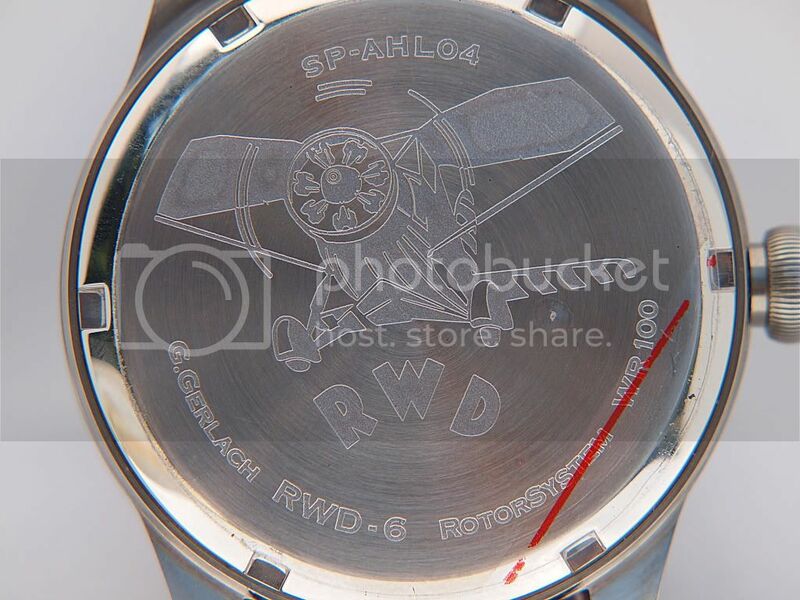 Overall, the RWD-6 is a well made, good looking pilot style watch that promotes Polish history. If one is searching for an affordable priced pilot style watch with solid specifications move this one high on the list. Thanks for reading and I look forward to your comments as always. Machine Head, YOWdiver and mystlawer like this. Last edited by UKWolfeman; 09-20-2013 at 06:46 PM. 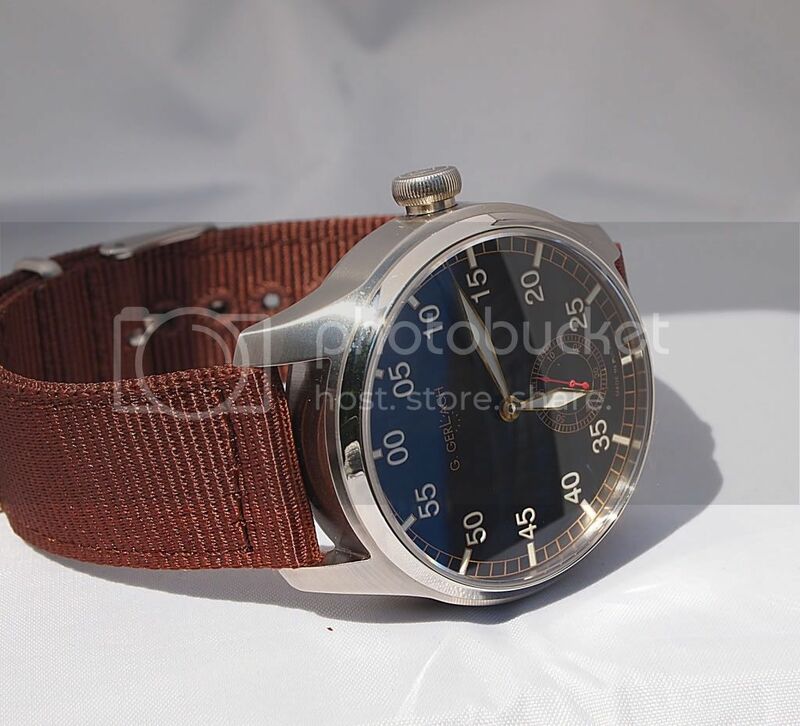 Thats not a bad looking watch but with a s*&t hawk movement (seagull) too bad, they are garbage. I work on watches for 3 hospital thrift stores and see many of those movements all messed up and there not that old. Wow great looking watch! I have a watch with SeaGull movement and it's doing fine. I have had it for over an year now. Great review sir, I believe that a great strap would really elevate the appearance of this piece. Love the gold accents on the hand and dials, it works well. Tattoo Chef and UKWolfeman like this. I was just looking at G.Gerlach's website literally days ago. I was wondering what those watches were like in the wild. I love the gilt on the dial and the gold hands. 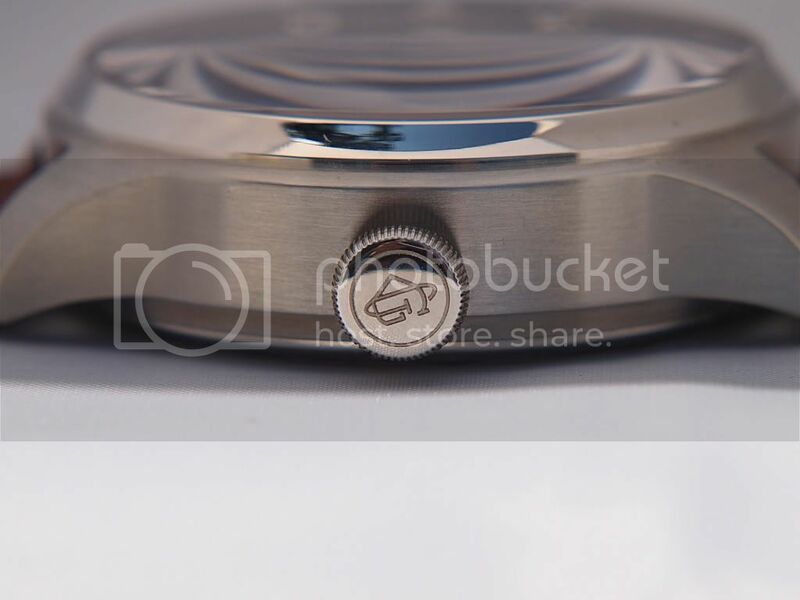 Why does the watch seem thicker than it needs to be? Great job, I'm glad to see a review on one of these. Tattoo Chef, UKWolfeman and n80leather like this. wow that is a stunner of a watch! "We are all alike, on the inside." - MARK TWAIN. Great review! I was really surprised that this watch was the price that it is. As you said it has quite a lineup. While the Nylon is nice I agree completely. A 20mm Ammo on this would look fantastic. Not my style, but a nice looking affordable watch. 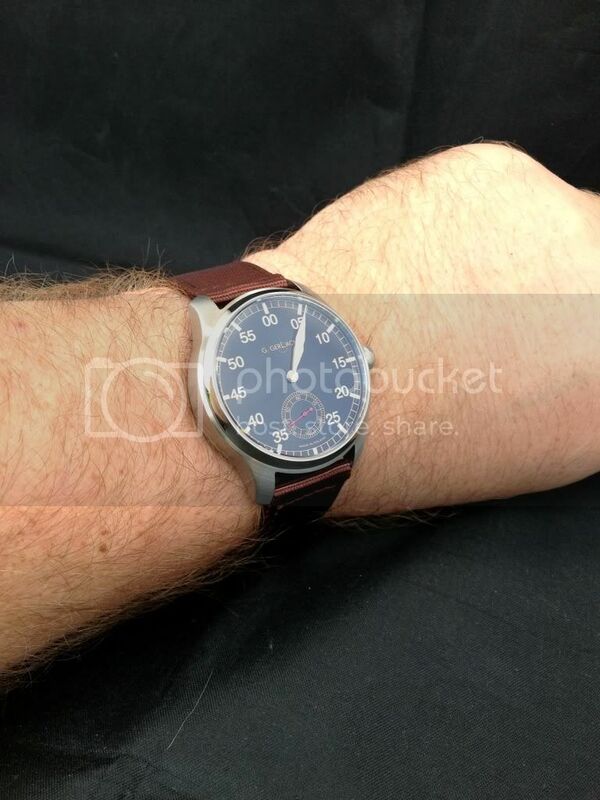 Nice review great looking watch. I do not understand why companies insist on using such a cheesy looking straps! Another strap that would end up in the trash if I got the watch! Great review Mike! Nice watch! Nice watch, another great review! Nice pics and review. I like the looks of this pilot and I need one in my collection. The Chinese movement scares me? Sounds great. Post up some pics and thoughts when it arrives. I guess the packaging was more beautiful than the watch..but still that watch has a healthy touch of elegance..a beauty. Last edited by DustinSeaman; 10-11-2013 at 02:22 AM.